What are the most important air conditioning components and how do they work? If you know some basic details, sometimes you can manage an unexpected failure without a professional help, rather than a serious one. In addition, you need to know when to not attempt any repair work. Professionals are best left with some complicated technical and mechanical problems. So most of the air conditioning consists of three major components. Compressors, condensers and evaporators are three very important air conditioning components that help cool the air. Air conditioning and refrigerator cooling mechanism is almost the same. Keep in mind that the repair costs for these parts can be very high. Try DIY aircon repair is not encourage for them. There is a simple mechanism – it absorbs heat as it turns into gas. Air conditioners use this mechanism to cool the air inside the house. These machines now partly help the mechanism. Air-conditioning ducts draw hot air from the room through the chemically filled coils, reducing the temperature of the air. Let’s take a look at the features of these machine parts and how they can help the entire cooling system. As mentioned earlier, the air conditioning system will bring the heat home to the outdoors. The compressor section of the AC is very important because it helps to convert the gas to a liquid form and assist in the cooling process. Compressors play an important role in the overall cooling system. The only difference between the refrigerator cooling system and the air conditioner is that the air conditioner has much more space to cool than the refrigerator. Compressor helps to circulate refrigerant continuously. Air conditioners use chemicals otherwise known as refrigerants. The AC converts gas to liquid during cooling and then converts the liquid to gas. When you switch on the AC and set the desired temperature, the gas or refrigerant reaches the compressor. Refrigerant absorbs heat in the house. It enters the compressor through the suction tube. The compressor squeezes the gas together. Closely packed molecules increase the pressure and temperature of the gas. Therefore, the compressor is responsible for the low pressure gas into high pressure state. When the high pressure gas gets hot, it enters the condenser. Into the condenser, the hot high-pressure gas is cooled and re-converted to liquid form. After the compressor, the second most important part of the air conditioner is the condenser. A condenser is a device that helps to condense elements from a gaseous state to a liquid state. This condenser is used for the heat transfer exchange process. Condenser is a type of heat exchanger. This part main function is to release the heat from the gas. In the refrigerator, a condenser is used to eliminate the heat from inside the device. For a home aircon, it also works the same way . The condenser sometimes looks like a radiator. Condenser is device which made of hollow coil . High and hot pressure gas flows to the condenser and into the coil as this is very important cooling process. Condenser then helps to escape the heat , bringing the temperature of the gas and becoming liquid form. The evaporator is another important part which helps to the last part of the cooling process. The cold liquid comes from the condenser where it turns into gas again. This is due to the low pressure in the evaporator. During this transition, the fan blows cold air over the hot air in the room, causing the air temperature to drop. Fan assists air and coil contact. The fan blows cold air back into the room again. As cold air is usually heavier than hot air, it descends near the floor. The gas leaves the evaporator and enters the compressor, repeating the entire process. The entire process is repeated until the entire room or office temperature reaches the limit you set on the aircon thermostat. 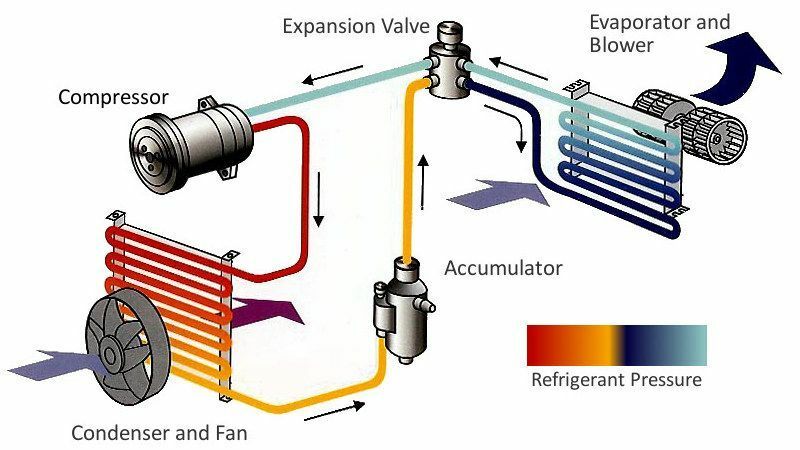 The Expansion valve controls the amount of liquid refrigerant entering the evaporator. The built-in filter of the indoor air conditioner helps to breathe clean air in the room. There is always dust in the air, which you naturally do not realize. AC filter function is to remove these dust particles. Over the past few months, these different airborne elements have accumulated on the filter. This is why most of the time you need to clean the filter or change the filter after a certain period of time to keep the indoor air clean and fresh. As we mentioned earlier, the thermostat is a sensor. You can set the desired temperature on the thermostat. It shows the level of air temperature you want in the room. The air conditioner will continue to cool the air until the air temperature reaches the desired level. Once the room temperature has cooled to this level, the sensor in the thermostat will notify the air conditioner and the AC will stop working for some time. When the air temperature inside the room rises again, the air conditioner will start to work. The AC section controls the sound generated by the compressor during operation. The compressor’s original sound can be very annoying. This is why this section can help you enjoy the comfort of your air in a quiet environment. Therefore, most of these air conditioning components for the effective operation of the machine is very important. These parts take some time to maintain and use carefully. After some time the compressor may get old and stop working efficiently. You will notice the change immediately because your AC will not provide effective cooling. The more you know about such mechanical materials, the easier it is to handle. 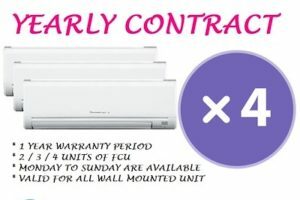 For more air conditioner information and service , you can visit serviceairconsingapore , the website providing all the useful tips for aircon servicing and pricing .